HOUSTON (KTRK) -- Some bad news for anyone who's craving a carnitas from Chipotle. Chipotle says it stopped serving pork at about a third of its restaurants after suspending a supplier that violated its standards. Chris Arnold, a spokesman for the Mexican food chain, told The Associated Press it's the first time the company stopped serving a topping for its burritos and bowls. 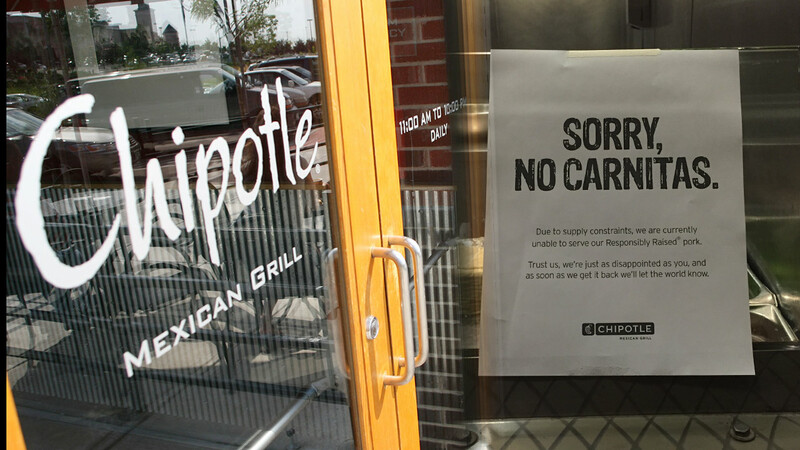 He said Chipotle learned of the violation by the supplier on Friday through a routine audit, and did not have a timeline for when carnitas would return to affected stores. At the location on Richmond in Greenway Plaza yesterday, a sign in the restaurant stated, "SORRY, NO CARNITAS." Arnold declined to specify the nature of the supplier's violation. But with pork, he said the most notable demand Chipotle makes of its suppliers is that pigs are raised in humane conditions. Some locations may still have carnitas. It's recommended you call your local Chipotle and make sure they have it first before showing up.